It was year 1925, late evening by the Polish-Czechoslovak border. Three women pilgrims were returning in the mountains from the Slovak village of Gabultov in Western Lemkovyna: Glafiria Demianczyk, Teodozja Demianczyk, and Maria Gawlik. In those times, the indulgence celebrations in Gabultov attracted masses of pilgrims every year. The Greek Catholic Lemkos participated also in the Roman Catholic celebrations. It was probably on one of those festive days when the three women from Wysowa returned home from the pilgrimage site ten kilometers away. It took place just seven years after the new state border has been marked out. The local folk was still unaccustomed to this new borderline and often ignored it the while visiting places on its both sides. The return path near the border led through the valleys of Cigolka and Zarubanec, overgrown with alder, where the border guards' eye could not reach. However, the last three hundred meters before entering the Polish territory had to be passed in the open field. That surely must have caused the three women's hearts to beat faster. Therefore, once they safely managed to cross the border and enter the nearby forest, they started their prayers to God, grateful for their safe return. Then all of a sudden, a bright light appeared and surrounded them, and with it - a threatening thought that they may get arrested. In an instant, they became paralyzed by fear and stood still expecting guards. Motionless, they were listening and awaiting the upcoming peril. However, the horrible silence filled with tension seemed to last suspiciously long. Eventually, the light disappeared and the women, not aware of what actually happened, feeling relief that the threat did not become true, completed their prayer with a triple sign of the cross, and then hastily continued their way home. This unusual phenomenon took place by the top of the Mount Jawor. The next evening, the women led by feminine curiosity, afraid of an unknown danger, replaced the youngest of them, Marysia, with certain Marta Demianczyk, and decided to return to the Mount Jawor, in order to investigate the area. They went there covered by the darkness of the night. And behold: the phenomenon of bright light reoccurred during their prayer. On the next day, the entire village found out about this event. People from neighbouring villages, intrigued by tales of the unseen phenomenon, began visiting the area. In the evenings, the Mount Jawor resounded with religious chants. The unknown light appeared rarely, following its own logic of time and witnesses. This was the beginning of the cult at this sacred place. The account of Stefan Kurylo, inhabitant of the neighbouring village of Blechnarka, has been preserved to our times. His father was sceptical about the tales of fantasy-prone women. On one night, while he was grazing horses in a place about two hundred or two hundred fifty meters away from where the women's singing came from, he saw a luminous glow. Scared by his earlier distrust, he later questioned women that were returning home after their evening prayers. However, the women, to his surprise, hadn't had such vision. The mysterious light that appeared on the Mount Jawor wasn't the only extraordinary phenomenon in this story. Glafiria Demianczyk, called Firyja by Lemkos, lost her husband during the World War I and was raising her three children alone. Severe famine occurred in that time, caused by a series of hailstorms, against which there was no defense, and which almost completely destroyed the crops. A grim food scarcity affected the pious Firyja too. She decided to seek support from her relatives living on the Czechoslovak side of the border. She departed there by the familiar route, making a stop for prayer at the place of miraculous phenomena. This trip, however, took an expected turn. Firyja was noticed by the border guards and sent back home without further consequences, which was a gesture of guards' leniency. Her feeling of relief has been overwhelmed by the helplessness and inability to feed her starving children. She was on the brink of collapse. Having passed some steps toward her home village, she fell on her knees, bowed her head and began to pray, contemplating her desperate situation. And behold, a mysterious light appeared again. Firyja raised her eyes and above the nearby juniper she saw surrounded by glowing light figure of the Most Holy Virgin Mary. - Do not cry, go home, your children will be satisfied... Having said these words, the figure disappeared, and the humble woman, after coming to her senses, filled with joy and hope resumed her way home. When she was approaching the village, from a distance she saw light in her house windows. Sudden fear struck her, as she had strictly forbidden her children to light fire. With this horrible feeling of insecurity, she rushed home. Once she opened the door, she saw inside her relative who, having heard of the disaster that destroyed the crops in her village, came all the way from the other side of the Mount Magura, bringing over supply of potatoes and grains. After the miraculous apparition of the Mother of God, the holy mount attracted visitors not only from Wysowa. 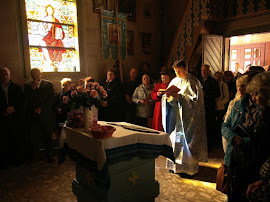 Glafiria, since the time she received the grace of seeing the Mother of God, has been coming to the apparition site every evening, to give glory to God.